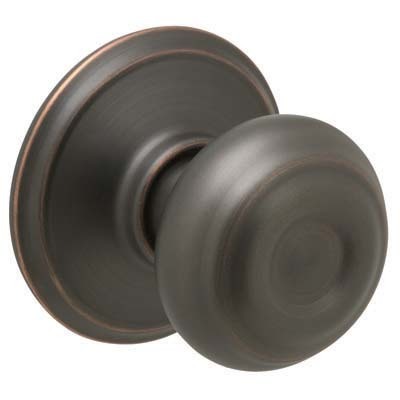 Schlage Georgian doorknobs have a simple, elegant design with a squashed round shape with a subtle recessed circle design in the end. 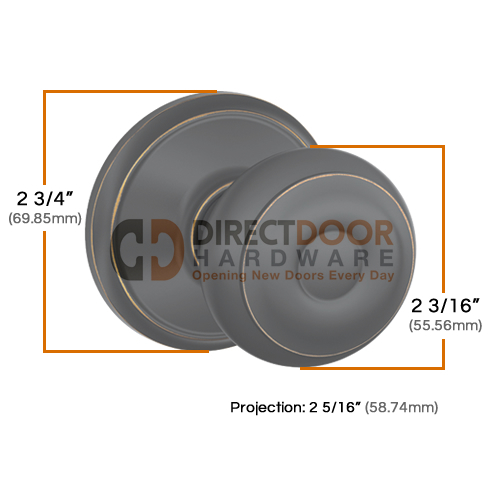 The Schlage Georgian doorknob is available in 8 finishes and 4 functions, making it a great choice for multiple applications and design styles. Schlage door knobs are packed with an adjustable latch that will accommodate doors prepped for drive in latches as well as latches with faceplates. 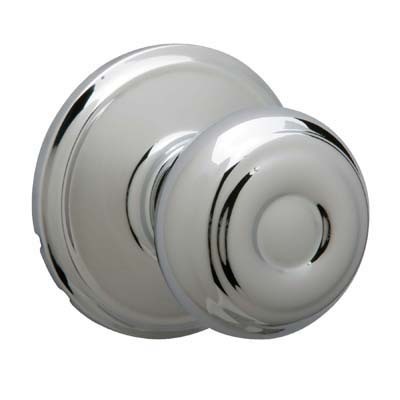 Schlage's versatile design makes these door knobs easy to install and a great choice for home owners and builders alike. too so we can key them alike. Note: Schlage entrance locks have a turn button on the inside and are designed to stay locked unless turn button lock is disengaged by the user. Schlage privacy locks have a push button lock on the interior which is disengaged when the knob or lever is turned from the inside. Finish Note: Oil Rubbed Bronze and Aged Bronze are quite similar. We are noticing more people prefer the Aged Bronze because it has more of a glossy finish with a rubbed look. The Oil Rubbed Bronze is more of a solid matte brown color. 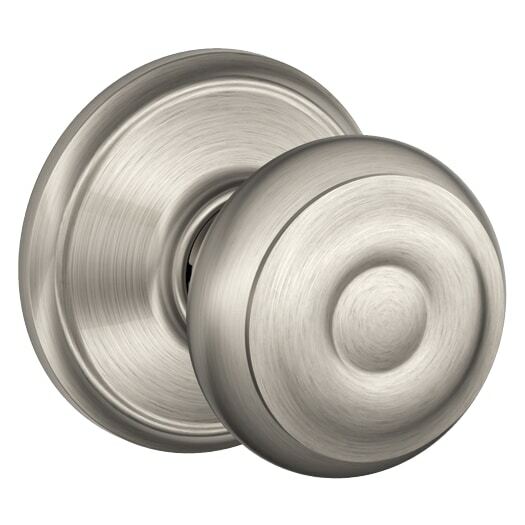 Schlage door knobs are available in several functions. Please review the descriptions below so you can order the correct door knob for your application. 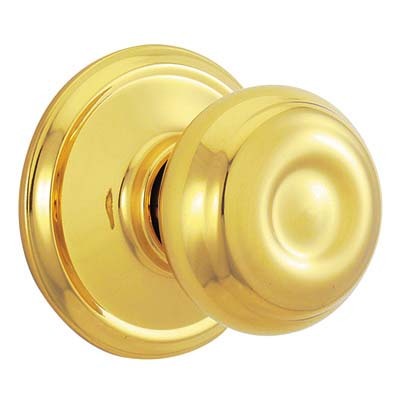 Schlage Passage [FA10] or Hall and Closet Doorknobs are used on doors that do not require a locking mechanism. Halls, closets, pantry or laundry doors will generally use a passage knobset. Passage knobs do not have a locking mechanism. Schlage Privacy [FA40] or Bed and Bath Door Knobs are most often used on Bedrooms, Baths or Office doors where a lock for privacy while occupied is desired, but a keyed lock is not really necessary. Schlage privacy knobs have a turn button on the end of the knob as shown to the left to activate the lock. On the outside, there is a pin hole for emergency unlocking. Some knobs will have a pin hole inside a circular piece, some just have a small pinhole. 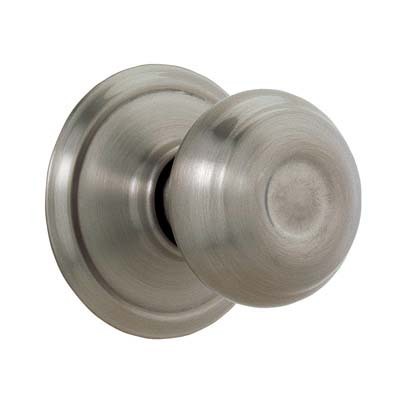 Schlage Keyed Entrance [FA51] Door Knobs are generally used on exterior doors, but sometimes used on interior doors where security is a concern. Schlage keyed entrance knobs have a push pin lock on the inside backplate, similar to a privacy lock. On the outside there is a keyed cylinder. If the knob is locked from the inside a key is required for entrance. If you are ordering several keyed locks of the same brand we can key them alike for you. Schlage Single Dummy [FA170] Doorknobs are sold individually. Dummy knobs do not have a latch or mechanism of any kind. These knobs are surface mounted to a door that has not been bored (large hole cut out) for a doorknob. 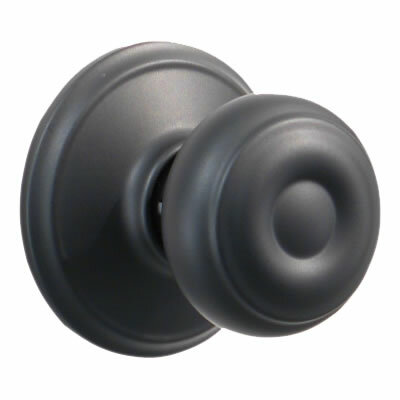 Dummy knobs are generally used on double doors that us a ball catch at the top to keep them closed so a latch is not required. They are also commonly found on the inactive side of a french door - a single dummy monted on either side of the inactive door. Schlage extends a lifetime limited mechanical and finish warranty and a one-year limited electronics warranty to the original consumer user (Original User) of our Schlage brand product (Product) against defects in material and workmanship, as long as the Original User occupies the residential premises upon which the Product was originally installed. See complete Schlage Warranty. 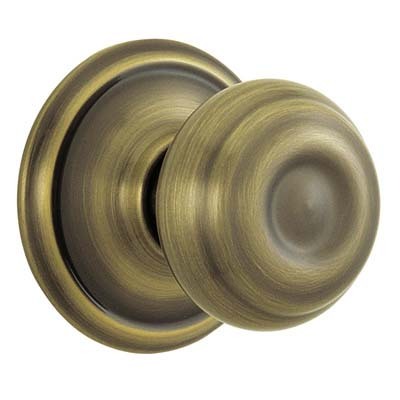 Schlage door knobs can be returned within 60 days of purchase. Before returning you must obtain a return authorization number so that we can get your credit properly issued. There is a 15% restocking fee on all returned Schlage hardware. Please see our returns page for more details. We love the quality and finish of these antique pewter Georgian door knobs so much, this is the second house that we have installed them in. 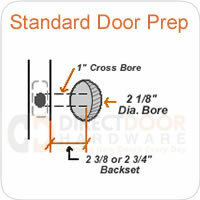 We also love the option provided by Direct Door to key all exterior doors the same. Great product!